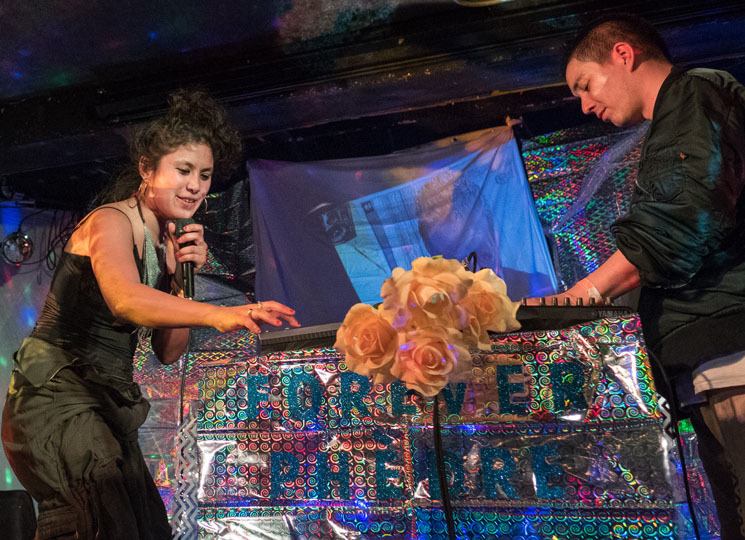 The last time Wavelength's annual festival saw Phèdre, April Aliermo and Daniel Lee's Hooded Fang spinoff project headlined the opening night of the 2014 fest, setting the tone for a weekend of sleepless celebration and thirsty discovering. This year, WL tapped them to send off the festival on an outré, Dionysian note, and their wobbly visions of electro decadence exploded across the stage in rainbow refracting cellophane banners, glitched out projections, and a revolving cast of special guest MCs. With local rappers Arowbe, Casey Garcia, and Lil Gae all on deck to spit bars throughout, Arowbe and Lil Gae opening the set trading verses over a booming, skittering banger, apart from latest singles "Zastroszy" and "Tivoli," Aliermo and Lee mostly broke from the dynamic of previous albums and concentrated more on handling the production side of things, cueing up fluttering samples and managing the warped, hyperactive attack of the beat machines. The frenzied, twisted bacchanal culminated in a grimy posse jam the duo dubbed "Phèdre Anthem," calling all their previous guests as well as fellow Wavelengther Han Han onstage to spit bars over the whole thing, fading into their own after party.